I am almost a bit embarrassed to review this calvados because this is quite an expensive bottling and somehow contradicts the “affordable alternative to whisky” philosphy that effectively made me start this blog. But anyway, when fellow blogger Sku gave a sample of this, I did not refuse. In a way, this is an independent bottling of calvados. 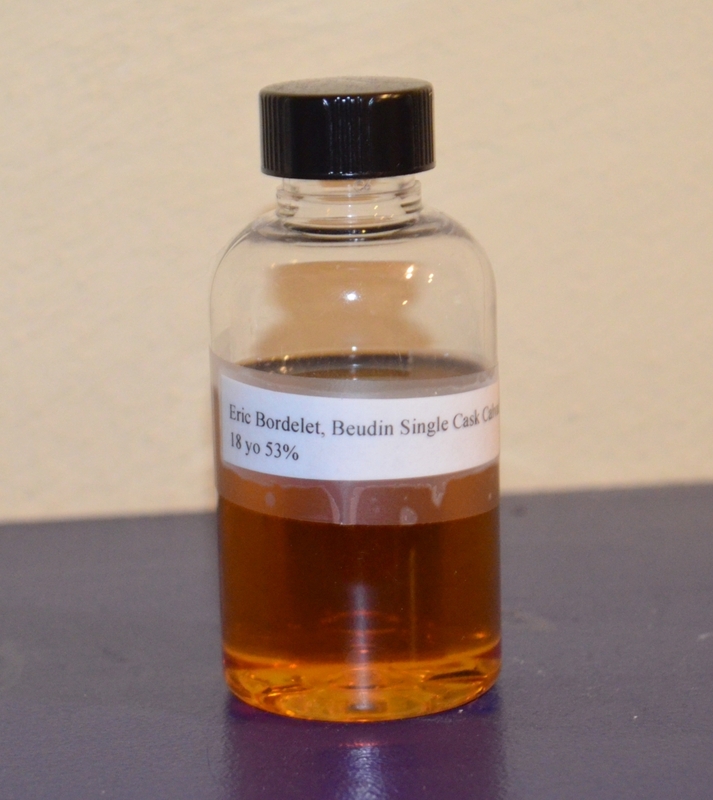 It is an 18 year old single cask distilled by Henri Bernard Beudin which was bottled by Eric Bordelet, a cidre producer who only rather recently also began to distill his own calvados. You can learn a bit more about this US exclusive bottling from the review at My Annoying Opinions. Nose: Sour apples, hints of grapefruit, polished wood, leather, cinnamon, cloves, a blend of light floral notes. Palate: Baked apples, lemon zest, toasted nuts, green olives (! ), cinnamon, cloves and black pepper. Overall: It’s huge, it’s bold, it is a monster. In whisky terms this would be the Laphroaig of calvados. This is not not everybody’s darling for sure. If you are looking for a gentle sipper to enjoy on the front porch on a mild summer evening, this is not for you. This calvados demands your complete attention. The tart element that is so crucial for good cidre and calvados is very pronounced here. This is achieved by using a high proportion of tart apples that would be virtually inedible raw. It even has an olive-like brininess to it that you can also find in some mezcals. So overall this is indeed a very unusual calvados. Next post: German Grappa? Yes, There Is Such A Thing.